In 1940 Bela Lugosi appeared in four films and toured in vaudeville on the East Coast for five weeks. 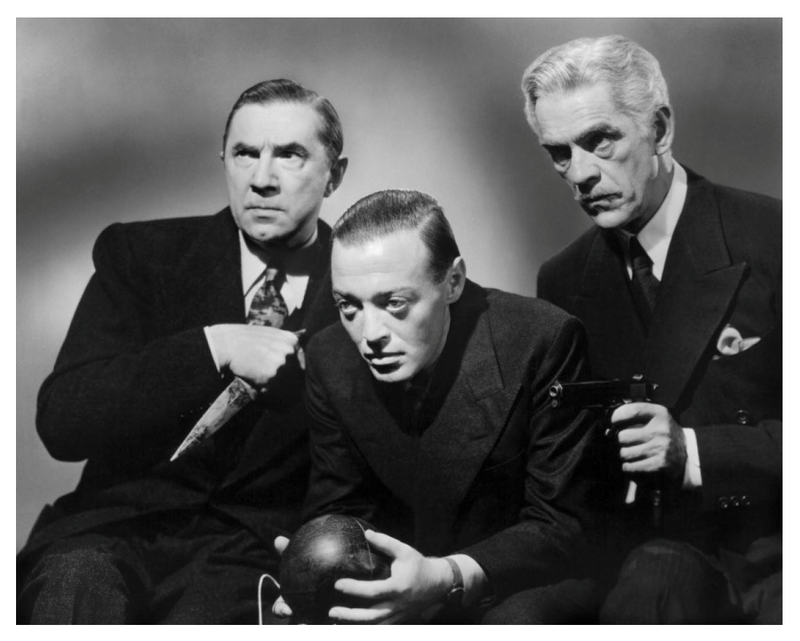 The films include his last co-starring role at Universal with Boris Karloff (Black Friday), his only film with Peter Lorre (a comedy at RKO, You’ll Find Out, also with Boris Karloff), and a murder mystery (The Saint’s Double Trouble). In all the movies, his billing outranks his screen time. His parts are small—in The Saint movie so small that his character does not even need a name. His only true starring role in 1940 is in The Devil Bat, the first of his mad doctor poverty row films that would dominate his movie career through the World War II years. In his interviews, he seems happy to be working and in demand, though the oddest article of 1940 shows that he was still trying to break his stereotype. His attempts to find a decent role away from horror and villainy involved his name very tangentially in a young and perhaps disturbed woman’s suicide. Had Bela “Dracula” Lugosi not added spice to an already juicy story, he would not have been mentioned at all in the coverage. It was a dark and stormy night. Mist hung over the mountains like a halo in search of a hero. It was the sort of dreary California evening Miami papers boast about in headlines. And it made me think of Boris Karloff and Bela Lugosi; and when you think of wither or both of them, you can’t sleep anyway. So I decided to call and try to arrange an intimate, heartless-to-heartless talk. Half an hour later, caressed by the fog, I found Boris Karloff’s Coldwater Canyon castle looming in front of me. The yelp of a dog pierced the still-born feeling of the night and sent an involuntary chill up my spine. But the whine of the hound brought my host to the gate, and the warmth of the crackling fire, the tumbler of sherry from a vat on the bat and broad smiles from Karloff and Lugosi made me feel at home. The Karloff estate is a showplace and Boris is proud of it because he planned and did most of the garden with his own hands. There is no wallpaper nor stucco work anywhere within the home, the walls are white brick, plain, solid substantial looking. The house is on a hilltop and completely surrounded by woods—an ideal setting for the type of picture you’re likely to see its owner featured in. Incongruous are the nursery touches trailing through the living room, said parlof and bar—rattles, dolls and hobby houses. Karloff’s happiness is centered upon Baby Sara Jane, born on the 51st birthday of her dad, November 23, 1938. I listened and thought how silly sitting here on a spooky night listening to two men who have given millions the jitters worrying for fear smoking will make them nervous. 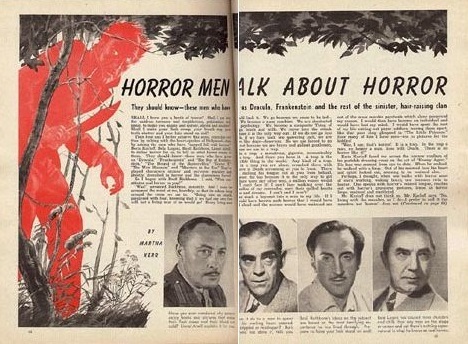 And I wonder if these men had been afraid to sleep alone in the dark when they were boys. 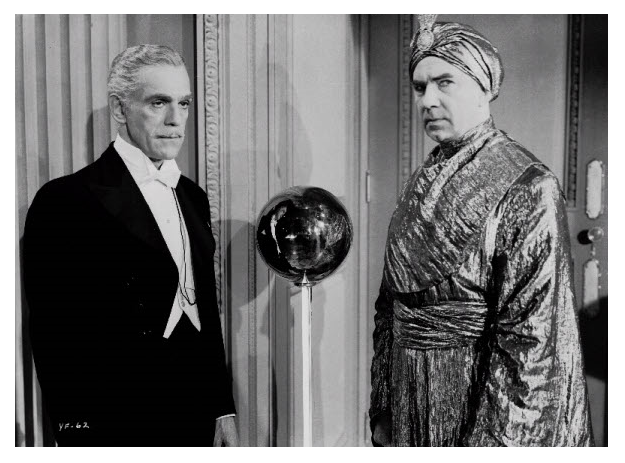 Karloff said emphatically “No.” And Lugosi said he wasn’t afraid to sleep in the dark because other members of his family slept in the same room, but many years later, when he came to Hollywood and rented a huge home, he lived alone but didn’t like it. I asked how he overcame lonesomeness. “Oh! When I married my first wife,” he replied. Mr. Lugosi’s matrimonial sweepstake gave me the feeling that even Tommy Manville might be a happily married man someday. Suddenly I jumped a foot. That haunted house feeling got me. Something was rustling around my ankles. And when I looked down, discovered a duck. Karloff roared. Karloff whistled, and in came the blackest Scotty I’ve ever seen. “Is that the wolf who yelped when I breezed in?” I asked. Both bogey-man came from Europe. Lugosi, a Hungarian, became an American citizen 10 years ago. He doesn’t take his citizenship for granted; feels he’s lucky to be an American, and thinks every naturalized American and every person born here should kneel every morning and utter a prayer for being an American. I wanted to get a little more of the bogey-mean stuff and I asked both gentlemen if they read detective stories. They don’t. Both prefer biographies, Gunther and Shakespeare to thrillers. They don’t mind being called bogey-men because it pays so well. Only difficulty is that it takes more out of them physically because it’s no cinch to work in heavy makeup for those grotesque characterizations. “Any credit that I got on the make-up in Frankenstein, Karloff remarked, “should go to Jack Pierce, Universal’s ace make-up man. When Director Whale saw me in The Criminal Code, he thought I just might be the one he wanted for Frankenstein; but when I auditioned for the part, it was Pierce’s genius and not mine that won. Lugosi said: “Even the part of the bloodthirsty “Dracula” didn’t haunted me. This may sound like a publicity story. But during the making of Dracula, I had an infected finger and when the doctor cut it and it bled a little, I fainted and couldn’t go back to being “Dracula” for two days. They get lots of crank letters, but are far from being the fan’s pets. Talking about fan mail reminded Lugosi of the time John Barrymore got an eight page letter from a fan who raved about how wonderful John was and ending up with: “Won’t you please try to get me a picture of Rin Tin Tin autographed with his paws. That’s like Douglas Fairbanks meeting the King of Spain and the King asking only about Fatty Arbuckle. Oh, boy! On, girl! Oh, bogey! A siren scream on Hollywood Blvd. Before I knew what I was doing I was out of my chair and halfway out the door. “Hold on, Hopper,” I said to myself, fighting that impish instinct which was pushing me out to investigate. It worked for a second more, until the second siren. The time I was down the elevator in such a hurry that I even forgot to put on the oriole laying an egg on a velvet nest (the salesgirl said it was a hat). I elbowed my way through the crowd down the street—and if you’ve ever seen Hopper’s elbows in action you’ll know what I mean. I had plenty of practice on the subway when I commuted for five years to Long Island. It wasn’t a particularly busy time of the day but there must have been 150 people crowding around the police car and the ambulance. The crowd pushed back grudgingly, but began pressing forward again. Their faces were a study. I saw curiosity on some, relief on others. Some said, “Gee I’m glad it’s not me.” There was fear on all. Definitely fear. The interne repeated his plea and finally called one of the patrolmen to clear a space around the victim. The people didn’t leave. They stayed right there until they bundled the poor fellow off to the emergency hospital. It all happened in a couple of flashes. Next thing I knew, I was back at my desk, thinking (Yes, I really do, occasionally). “Hopper, what makes people do that?” my brain kept asking. Let’s take Bela first. I found him sitting on the set for You’ll Find Out, watching Boris Karloff and Peter Lorre doing a scene that gave me the creeps. 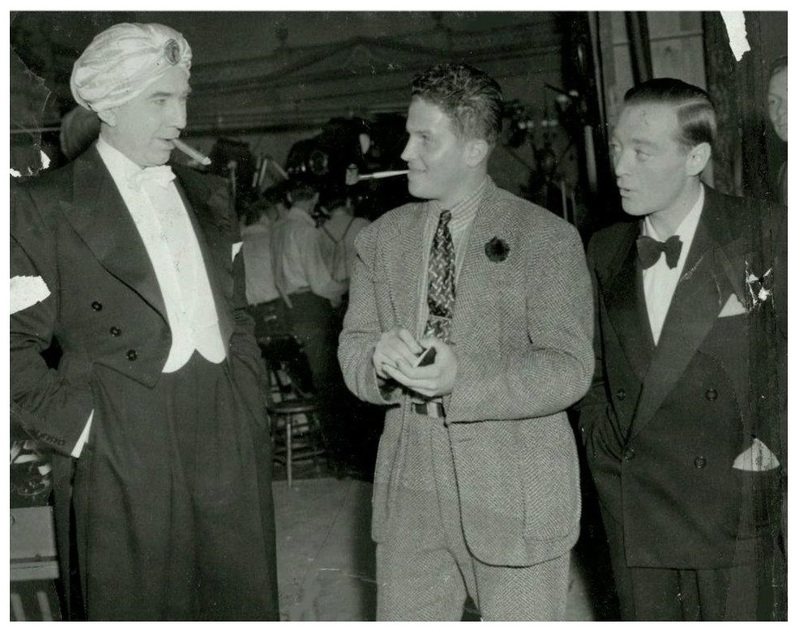 Karloff and Lorre were plotting a way to dispatch Helen Parrish into Kingdom Come. “What skeleton?” I asked, feeling that maybe Lugosi knew too much about me. And so I believe it will be, even in this present war, as it has in all the others. But when peace finally settles again over the earth, let us for once in the history of the world, do unto others as we would have others do unto us. Hollywood, Nov. 13 — The boogie men have gone streamlined. But don’t relax! They still can make your hair stand on end in electrified spikelets. Yes, the Three Leers are all duded up. Bela flaunts a swathe of metal cloth that would make some glamor girl a dandy cocktail frock and a turban worthy of Lilly Dache. Peter Lorre wears a decorous dinner jacket while Boris Karloff is the biggest surprise of all in white tie and tails. In fact he looks suave enough to make the heart of most any woman over 25 do a definite pitty-scoot. But be careful! And don’t accept that orchid corsage! It’s tied with a baby cobra. Time was when the public was satisfied with one bogie man, but not now. Today they demand a batch. Surely there is a reason for such wholesale horror-hankering. Lugosi—good old Dracula—traces the urge back to our ancestors. Back to that era when caves, instead of night clubs and penthouse apartments were lined with leopard skins. Back to that era when women never had to use tweezers on their eyebrows because they were habitually lifted arches of fear, over quick-moving watchful eyes. In those dim, lone gone days, people developed an exceptionally keen fear instinct that warned of danger. However, as time went on the cavemen—when they were not on hunting expeditions or dragging their mates around by the hair of the head grows devoted love—invented weapons to conquer various beasts, until here we are, in the present with a perfectly good, well-developed capacity for fear and not enough work for it to do. So, as an outlet for our instructive danger craving, we take out fright by proxy, as it were. Some read murder mysteries, preferably an Agathe Christie with 10 victims, or go see horror pictures. If you like horror pictures, you’re not crazy, Lugosi claims. You’re simply atavistic. Just two months ago, Bela Lugosi, screen boogey man, who achieved immortality as Dracula, offered Yolande Evans, play broker, world traveler, leading figure in many adventures, $10,000 in cash for a story that would fit the shocking character by which the public believed him possessed. “I like horror parts sincerely,” he had said, “but not exclusively. I like a part with a little of everything in it. Romance, too.” Just such a story was developing in Yolande Evans’ mind, but she did not sell it to the eerie actor. He was disappointed when he did not hear from her—until he read that she had killed herself. Where, now could he get that story? Well, he has the story and without paying $10,000 or $1 or even a dime. What is here set down represents a rough sketch, a first draft of Yolande Evans’ story. Any journeyman scenarist can fill in detail and dialogue. The scene of the story swings between Hong Kong and Hollywood, with a long interval on Broadway, a brief interval in a French jail, and episodes in many American cities. She seemed pursued by a horrible hallucination of fear that at times appeared to assume almost human form and within her heart burned an insatiable longing for love. So, she came to know many men, to encounter exotic adventure in many forms and finally to seek in suicide sanctuary from the pursuing fear! They found her dead, alone in her smart New York apartment with gas pouring from three burners in the kitchenette stove and on the telephone table a pad with the beginning of a penciled memorandum. “Call up ____.” Neighbors said that her broker husband, Harry Evans, had left the apartment the night before carrying several suitcases. Pictures affectionately inscribed and letters from celebrated screen and stage stars were found, too. Edmund Lowe, Dorothy Mackaill, Lenore Ulric, Gladys Cooper, Ruth Chatterton, Edward Everett Horton, and others were represented. Apparently, almost all wanted plays and stories but Lugosi was most insistent. He offered $10,000 cash! Death came to her as the German troops were slashing across Scandinavia into which Hitler’s squadrons had been admitted by traitors. Of course, this must have been pure co-incidence—but Yolande had made mysterious trips to Europe and the Far East, with passports issued under strange names and the coincidence may be worth noting, Mr. Lugosi. As detectives dug deeper they found a fantastic figure developing, a dark, beautiful girl, ever on the wing as if pursued, often changing her identity. French, she was assumed to be, and she left the assumption pass, but the fact seemed to be that she was the daughter of Tuscan parents who came to live on New York’s East where the child, Yolande, was born. Yolande, Iris, Uelanda and other names she used in New York but even before that—at seventeen—she was the heroine of an elopement, imprisonment and estrangement! Ten years ago, she met a young transportation man who infatuated her at first sight. They were married two days later. Fear seemed to seize her then and within three weeks, she pleaded with the bridegroom to leave town with her at once. He refused. Penniless, she left him disappearing utterly, while the bridegroom searched the city. Two days after the girl vanished, she reappeared—on the high seas, climbing from the hold of the Ile de France on which she cleverly stowed away. Doesn’t Yolande Evans’ story begin pretty well, Mr. Lugosi? The dark child of the tenements, with the angelic face and fear-haunted eyes…the first thrill of love…the elopement and marriage…and flight again…with the big steamship …and the fear and terror gradually taking form…can’t you see yourself the personification of that bat-like figure, Mr. Lugosi? By all the rules of fiction, the little starving stowaway should have captivated captain and crew and dominated the luxury liner, but Yolande didn’t. She was assigned quarters with the steward and put to work for her board. By all the regulations of romance she should have met a French nobleman, a Hollywood producer, a Broadway millionaire—perhaps she did, but none of these did anything about it, so far as the record shows, at that time. But the idea, though trite, is still good, Mr. Lugosi. When the liner docked at Havre, the stowaway was tossed into jail for five days. Home she came and thereafter was lost to fame for several years. There came after five years, the expedition to Hong Kong and by that time, the transportation man and Yolande had parted and perhaps forgotten one another. As Iris Fontana, in 1935, at twenty two years of age, Yolande went to the Orient to study war conditions for publication and radio broadcasting. She returned last October and opened a Broadway office with a branch in Hollywood and gradually she became a figure of importance in the sphere of stage and screen—China—California—and Broadway in the middle—with fear taking more definite form gradually and Yolande feeling the increased need of protection. She hid behind other names than Yolande Palmer, Iris Patten, Iris Johnston. Yet officially she was Yolande Evans on Broadway and in Hollywood, after she met Harry Evans. She made money, too, and her Hollywood activities prospered. Then, just when things appeared at the peak, the vague fear became very definite and after Evans removed his luggage, Yolande could not stand life alone. Even the Lugosi offer of $10,000 and 10% meant nothing. Why? The question remains open, wide. Why that strange, swift trip to the Orient and the prompt Hollywood connection that followed her return? Why the endless changing of her name? Why the fear—and the suicide? There’s your story, Mr. Lugosi, and what do you think of it? An amusing experience and an opportunity to play a completely new and different role was recently afforded Bela Lugosi. In Hollywood, scene of so many artistic and jealous feuds, the conduct of the leading Horror Men is a refreshing change from the usual pattern of these artists. Rather than being envious of and embittered at each other, they are not only friendly, but thoroughly interested in each other’s work. They never fail to see their rivals’ pictures and their discussions later have helped each of them to improve their work, which accounts for the amazing betterment of the quality of their type of production. Thus it was quite natural for Bela Lugosi to drop into a neighborhood theatre one evening where one of Hollywood’s other Bogey-Men was attempting to scare the audience out of its collective wits. So, Bela Lugosi, the big bad Bogey-Man found himself consoling a fair damsel in distress, something he has not done since the early days of his career. Finally, the young lady recovered enough to relax her grasp and as the picture ended, Lugosi gallantly asked her if she would care for an ice cream soda. Lugosi has not seen the young lady since, but if she goes to view his performance in The Devil Bat, she had better go well prepared. 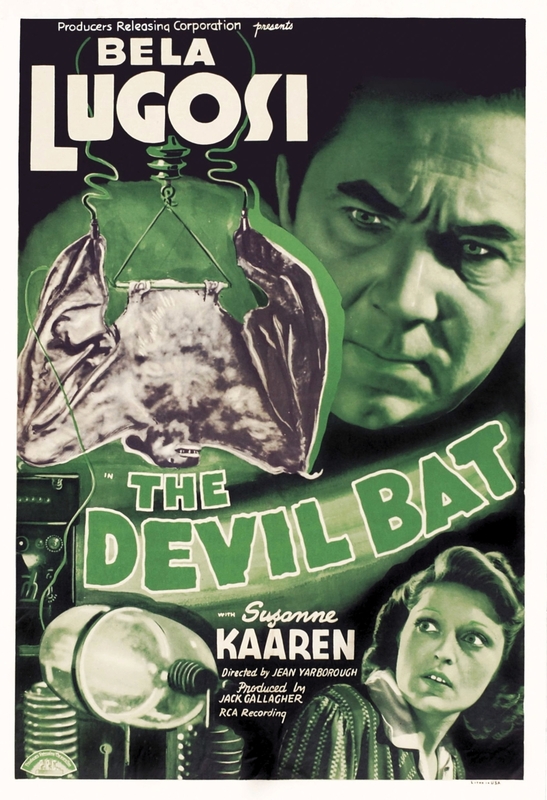 No less an authority than Bela Lugosi himself, who played the leads in both productions, asserts that for sheer dramatic tension and unadulterated horror, The Devil Bat, his latest starring vehicle which opens today at the Rialto Theatre, far outshines that masterpieces of another year, Dracula. 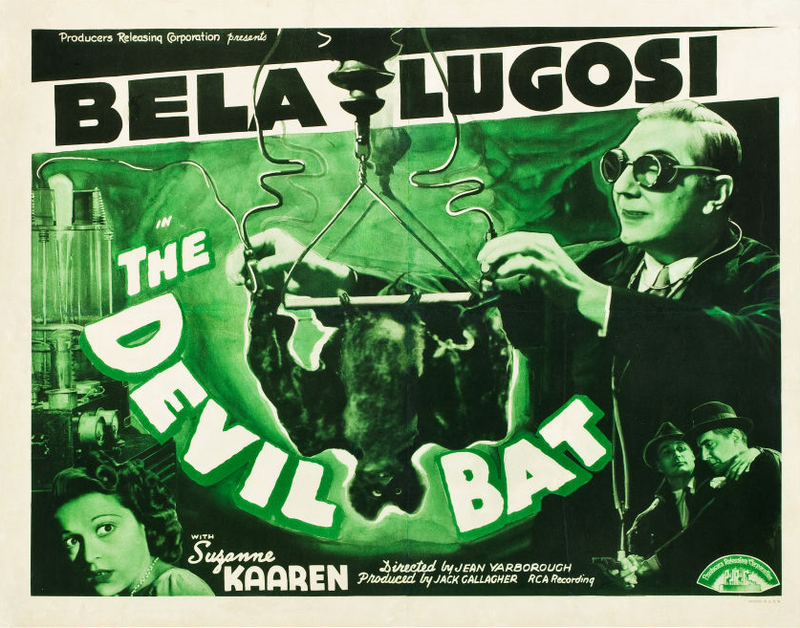 Devil Bat has afforded Lugosi with the meatiest role of his long career and to it he brings a completely new and different approach and interpretation. George Bricker’s story which begins with an interesting study of injustice to a highly sensitive mind allows Lugosi to use his entire bag of tricks, and a mighty full bag it turned out to be. Lugosi admitted not only to his friends and associated but also to the press that this role in Devil Bat has provided him with the most interesting problems of his career. In Devil Bat he admits he has used an entirely different approach to his subject, one which has elicited huzzahs from critics and fans alike. He has thrown overboard the old rules and uses forms and patterns both startling and new. For those that like eerie and unusual entertainment a là Lugosi, this picture should not be missed at the Rialto today or tomorrow.